Some treats are a no-brainer. So easy and simple that they basically make themselves. The idea is simple, and really so are the steps, but whenever there are candy melts involved I hit a hiccup. I wish I were an expert candy-melterer like Bakerella. But somewhere between the melting and the tapping something gets lost in translation. So I settle for a more “rustic” candy coating. Textured, if you will. Especially trying to cover a bumpy krispie treat in smooth candy coating. I dare you to make it work. Anyway, let’s talk Patriotic Krispie Treats. Easy idea, and if you can embrace the rustic finish, like I have, you’re golden! All you have to do is make your krispies. I used these Brownie Batter Krispies. Using a star cookie cutter I cut my krispies out. I melted some red, white and blue candy melts and “painted” it on the krispie. If you made plain krispie treats, you could even omit the white candy melts. And if you want you can put them on a stick…just press the stick in when the candy melts are still wet. Now, my sweet friend, Callye from Sweet Sugarbelle has challenged a few of her nearest and dearest to a “Star Cookie Cutter” Challenge. Well, not so much a challenge, but a fun way to see how lots of creative people would use the same cookie cutter. Isn’t that a fun idea? Thanks so much for including me Callye! Now, let’s check out what the other ladies did with their cutter! Oh my goodness — these are adorable!!! I much prefer the “rustic” look anyway! 🙂 So cute!!! How fun!! Candy melts always give me a hard time too – – but I adore your stars. Sometimes, that “home made look” is better than anything else <3 I love it. oh you just made my day, I will now call my lumpy white chocolate cake pops rustic! I like the “rustic” look because you get an idea of what’s hiding underneath the coating. I think they look wonderful! I love Krispie treats and these would be just perfect for me to pop in my mouth! YUM and Cuteness on a stick! Beautiful!!! Jon David would love a few of these. I was just thinking that I need to get on the ball for 4th of July. Thanks for sharing your treats and for all the fun inspirational links! Love all of the stars! So fun! 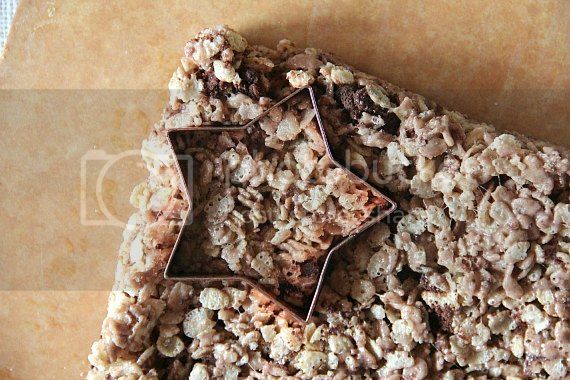 star rice krispie treats! so easy and yet, so festive! Candy melts give me a headache sometime too. For as “easy” and “convenient” as they may be, I find them hard to work with at times! The rustic look is what I always end up with too. I’m going to a 4th of July cookout this year, and this looks like the perfect dessert to bring! It won’t make my kitchen unbearably hot, and looks totally festive and delicious! Maybe I’ll make my life easier and do some completely red, some completely blue, etc. So cute! I’m thinking of all the possibilities with this idea! Lovely. What a fun and cute treat for Fourth of July. 🙂 ? This is the first time I’ve seen your brownie krispie treats (checked out the post on them) and they look delicious. Using them with the red, white and blue candy melts in this July 4th treat was a great idea. It won’t be only the little ones wanting to gobble these up! How cute are those?!? You ARE the Krispie Queen! Do you have a crown? These are great!!! I know the kiddos will be begging to make these with me today! I’ll take 365 please, to last me until next July 4th. Um, yum. Yummy! I’d actually take a Krispie treat over a cookie any day! These are so cute – love! These are adorable, and I’m sure delicious too… the perfect combo! So cute!! I was wondering how you were going to merge this with your brownie batter week, but you did it! Sounds fabulous, and look s like a fun treat! those are so adorable!! perfect for the fourth! and i love rice krispies!! yum!! these are so fun and a perfect treat for next wednesday! not to mention, fun to eat up since they’re on a stick! Those look so cute! I love the rustic look. Who needs it to be perfect?! They are still just as tasty! And beautiful. And tasty… did I say that already??? I am NOT good with those candy melt things either. LIke at all. But I do think these are UBER cute! What a wonderful fun and yummy project! Love this so much and love how you took the photo. I can see a line of kids lined up with big smiles with red and blue lips enjoying every delicious bite! These are adorable!! I use candy melts ALOT! The thing I’ve found that works the best is melt them on 50% power, checking every 45 seconds or so, and if you need it thinned a little bit add in just a teaspoon or less of oil. There’s also a product called FLO-COAT by AmeriColor that works well with candy melts, but a drop will do ya! I’d like to invite you over to Sweet & Simple Sunday to share your beautiful creations!! I love all of your creative way to use the cookie cutter. I think I have a star cutter and will have to dig it out! I’m all about the rustic look. Love these! These are really cute. Very festive. I hope you’ll add these to my Patriotic Project Parade. I would love to see them there. Really cute and great for the Fourth! I think the rustic look really works. Great idea!! Hi, will the rice krispie crack when uses a shape cutter? what do i do with it if it cracks? it shouldn’t if you cut them fresh!